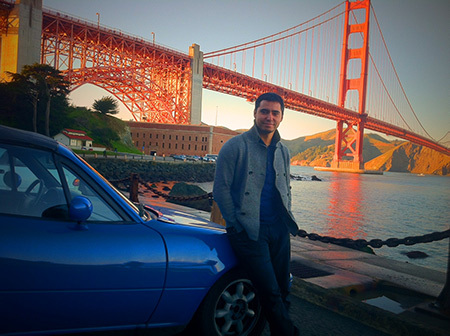 Congratulations to David on the selection of his litle blue 1990 as the April Miata of the Month! "A smurf that likes to surf"
You can guarantee that when it comes to transporting long objects, the Miata is not your first choice. Probably not your second choice. Luckily for me, I ride a shortboard! The size of my surfboard is six feet three inches. Yes, you can fit a 6'3" surfboard with the top up in a Miata. It fits even better with the top down! And on the way home from the ocean after the sun goes away, you can stick part of it out the zippered window if you have one. 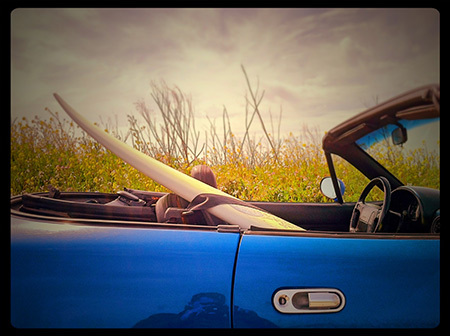 Therein lay my only requirement for a car before I owned my Miata: Can I transport a surfboard in it? Before realizing all this, and before finding my Mariner Blue 1990, I had been hard at it googling "surfboard in a miata". No results or photos were found that satisfied my question. But I wasn't going to let that stop me. I had wanted to own a miata for nearly 10 years. I already had another car, a four door Jetta. My surfboard would fit fine in there if it didn't fit in the Miata. When I finally had the spare cash to own my dream car, my desire to own a Miata was at its peak. A craze you might say! I looked at three Miatas before finding my smurf. I had never seen a Mariner Blue in person and love at first sight was an understatement. It stood out in the parking lot. Bright blue, it looked like the ocean. Surrounded by a sea of grey and brown, four door, nameless cars, so boring in their design yawning at them would be a compliment. She stood there with the top down. "Drive me, I'm fun". Maybe she didn't say that but that's what I think I heard. I paid $1200 for her. She was rough, but under those bruises and dents was a winner waiting for someone who cared more. I cared more. Fast forward 3 months and a tornado of repairs and many mornings and nights, the little blue smurf that could was finally ready take me surfing. In Northern California going to the beach is something most people do on a Sunday or a Saturday once a month. And only for a short walk down the sand to let their feet play in the cold water. I am one of the weird ones who braves the cold water and the white sharks to freeze and hope for some good waves. A trip to the beach for me is over an hour each way - something I love to do at least three times per week. Even on work days...and the Miata was going to take me there. She not only had to fit my surfboard, she had to be reliable. She was up to both tasks in spades. Soon my hour drives to the beach turned into two hour drives up Highway 1 and back. I went the long way. Drives on all the twisty roads the Bay area had to offer, surfboard sitting shotgun. 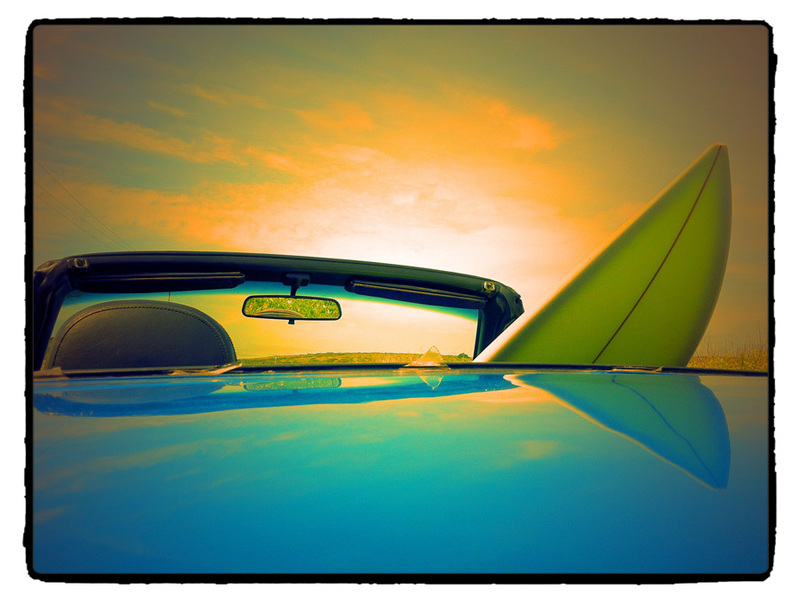 The funny stares and smiles I got from other cars as they saw a little blue convertible drive by with a surfboard sticking out the top - those looks and smiles still haven't gotten old to me. Nether have the waves from other Miata drivers. Highway 17 over the mountain to Santa Cruz used to be a chore in the Jetta. 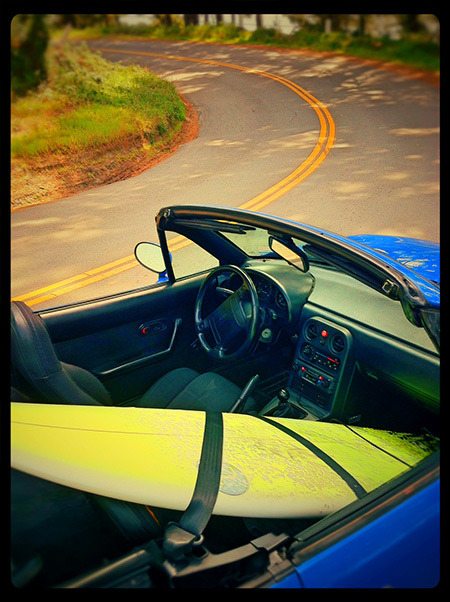 In the Miata it has been nearly as fun as surfing to me. What amazes me most about my Miata though, is not just the wonderful handling, the joy of driving it, the simplicity of its design. What amazes me is that it truly is timeless. Simply put how young the car still feels with its high revving engine. I find myself thinking "how can this car be 23 years old?" as I drive it to the ocean. In the world of surfing, sometimes you don't get any good waves, and sometimes you have a great day and get them all. To me though, the Miata is like a great wave, one that is consistently breaking towards the sunset, bringing me joy and taking me where I need to go. Or where I want to go...to the beach.